Feb 2, 2015 5.5-magnitude earthquake shakes Nepal's Pokhara. Sept 11, 2014 Earthquake resistant water tanks constructed. Jan. 10, 2014 Kathmandu tops quake risk list in the world. March. 6, 2013 5.4-magnitude quake rocks western Nepal. Dec. 2, 2012 Quake of year 1255 points to Himalayan risk. Nov. 5, 2012 5.7 quake rocks Kathmandu. A moderate earthquake, which the National Seismological Centre said was 5.7 on the Richter scale, hit th Kathmandu Valley at 6:52 pm on Monday evening, sending people out of their homes. Dr Soma Nath Sapkota, chief of National Seismological Centre in Kathmandu, told a television station that the preliminary information suggested that the epicentre was in Tibet bordering Sindhupalchowk district of Nepal, 136 km north-east of the Kathmandu Valley. Television channels reported that tremors were felt in eastern Nepal also. According to Thakur Prasad Kandel, seismologist at the Surkhet-based Seismological Centre, some people in Rukum reported that they felt the tremors in the western district also. No casualties have been reported yet. Oct. 26, 2012 Nepali radio stations ill-prepared for earthquakes. Radio stations in Nepal, critical sources of emergency information, are ill-prepared to withstand or operate in the event of an earthquakes, experts warn. "If there is an earthquake now, radio broadcasters would be vulnerable given that they are stationed in earthquake-vulnerable buildings,” Man Thapa, programme manager of the UN Development Programme’s comprehensive disaster risk management programme, told IRIN. Read more. 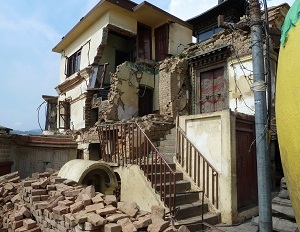 April 11, 2012 Indonesia hit by strong earthquake, tremors also felt in Nepal. Tremors were felt in Kathmandu and adjoining areas on Wednesday afternoon while a massive earthquake of 8.7 magnitude hit waters off westernmost Aceh province of Indonesia. read more. Prime Minister Dr Baburam Bhattarai has said the government is committed to devising effective laws and policies for the reduction of earthquake risks. It is a social crime to not make the hospital and school buildings earthquake-resistant, he said, directing the concerned bodies to make buildings by adhering to the building construction code of conduct. Read more. Various governmental and non-governmental programmes are being organised across the country on Monday, to mark the 14th National Earthquake Security day. Nepal has been observing January 16 as Earthquake Security Day every year from the year 2000 onwards in memory of the 1934 quake to underline the community’s role prior to and after the disaster. Read more. An earthquake measuring 4.9 on the Richter scale was felt in parts of Taplejung district at 2:03 am Thursday. According to the National Seismological Center (NSC) of the Department of Mines and Geology, the epicenter of the tremor is believed to be near to the Mt Kanchanjunga, one of the highest mountains in the world. Read more. A magnitude-5 earthquake hit northeastern part of Gorkha district at 5:45 am on Sunday. According to the National Seismological Centre, the earthquake had its epicentre in an area 50 km northeast of Gorkha district headquarters. The tremor was felt in most parts of western Nepal and the Kathmandu valley. However, there were no immediate reports of any damage caused by the earthquake. With rescue work still under way in Nepal after last Sunday's deadly earthquake in the Himalayas, scientists have warned that the capital Kathmandu is a high-risk city unprepared for the next "Big One". Experts say Kathmandu is one of the most vulnerable cities in the world with an overdue earthquake predicted to kill tens of thousands of people and leave survivors cut off from international aid. 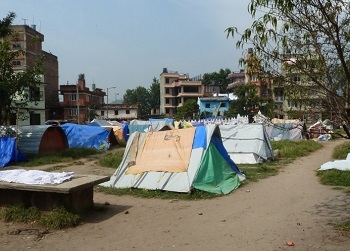 British geologist Dave Petley described the latest tremor, which killed eight people in Nepal, as a "wake-up call" for the overcrowded capital, home to two million people and connected to the outside world by just three roads and one airport runway. An earthquake measuring 4.2 on the Richter scale was recorded at 10:55 am on Tuesday. According to National Seismological Centre under the Department of Mines and Geology, Godibang and its neighbouring areas of Pyuthan district is the epicenter of the quake. The earthquake that shook the Kathmandu Valley in the wee hours of Monday morning (at 1:55 a.m. Nepal Standard Time) had its epicentre in China's Xizang-Nepal border region, according United States Geological Survey (USGS). Minor tremors were felt in Kathmandu and many other parts of Nepal at 10:45 am NST on Friday. The quake that measured 5.4 on the Richter scale had its epicenter in Western Xizang, Tibet, reports citing data released by the United States Geological Survey (USGS) said. 12th National Earthquake Safety Day marked. Prime Minister Madhav Kumar Nepal said the earthquake that rocked Haiti recently comes as a warning bell for a country that lacks necessary preparedness and mitigation measures to minimise the vulnerabilities of natural hazards.